This bell in particular was found at The Hyde in Ingatestone, Essex, and is speculated to have come originally from the Blackmore Priory, which exists today as The Church of Saint Lawrence/Jericho Priory in Blackmore. The Hyde was once the largest plot of land in the parish of Ingatestone and Freyerning but has since burned down after a deliberate fire in 1965. This bell is clearly the Sanctus bell of some church but the original parish name remains obscure despite historical and archaeological research. Historians suggest that the bell moved from Blackmore Priory to Smyth’s Hall, and then was later bought by Mr. John Disney of The Hyde, a popular antique collector, and remained at his estate until it was collected for research. The bell’s history is veiled in obscurity because it was discovered in the stables of the Hyde and is estimated to be 250 years older than all other bells of the area, as it was made around the year 1340. 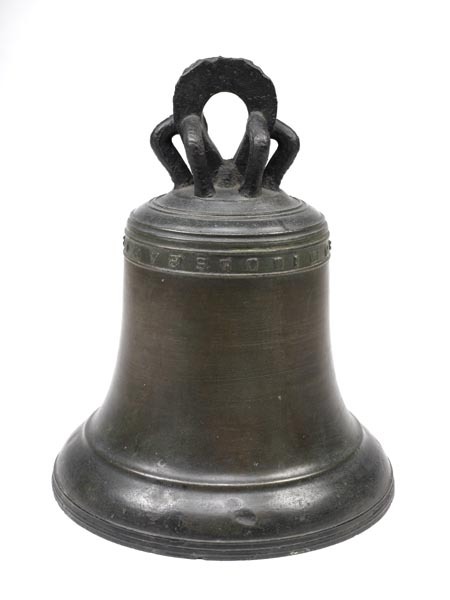 It is inscribed “PETRVS: DE: VESTON: ME: FECIT”, Latin for “Peter de Weston made me.” A well-known bell founder of the time, he has made other bells found in Middlesex, Essex, Berkshire, Buckinghamshire, and Oxfordshire. It is 440mm in height, 360 mm in diameter and 29 kg in weight. 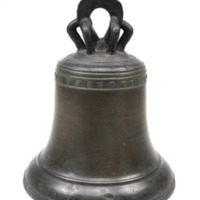 Peter de Weston, “Church Bell of Blackmore Priory,” Medieval London, accessed April 22, 2019, http://medievallondon.ace.fordham.edu/items/show/37.